How a trek to Machu Picchu taught one woman the benefits of travelling with a purpose. The group summits Machu Picchu. A bucket list, a vacation jar, a vision board, a Pinterest board. We all have them: Places to collect our dreams of exotic travel to far-off destinations, to learn about another culture and to learn about ourselves. It’s all part of a new generation of travellers who want more than a few snaps. It’s not enough to vacation in Fiji for a few weeks and sip cocktails in the sun. Today’s adventure-seeking travellers are looking for an experience, a connection with something meaningful. For many, the opportunity to give back through travel offers exactly what they’re looking for. That’s what brought Heather Starmans to The Arthritis Society last fall to try out the Charity Challenge program. Charity Challenge is a travel expedition group that leads breathtaking treks around the world–offering everything from hikes to bikes to skiing treks and more–while directly supporting charities like The Arthritis Society. 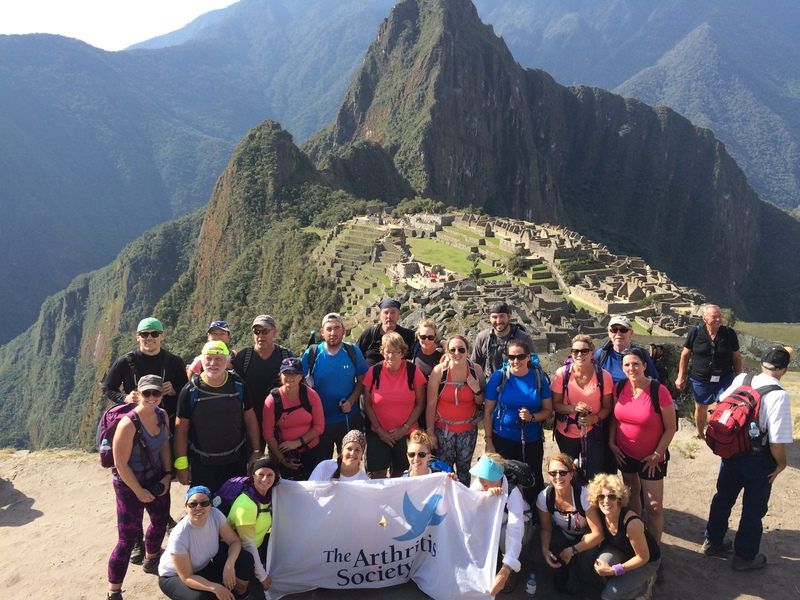 Over the past year, two groups of Arthritis Society supporters have made the once-of-a-lifetime trip to Machu Picchu, the ancient capital of the Incan empire perched high in the Andes Mountains of Peru. Joining Heather on her nine-day journey were arthritis patient advocates, the president and CEO of The Arthritis Society, and everyday men and women looking for a world-class experience while giving back to their communities. The trek was more than just an adventure for Heather–it was personal. Heather lives with ankylosing spondylitis, an aggressive form of inflammatory arthritis that targets the spine. Heather was still in her 20s when she underwent spinal fusions and corrective surgery, and was told by doctors that she would likely be confined to a wheelchair for the rest of her life. She refused to accept this as her fate and began researching her illness and ways to help herself. “I was stuck in a desk job,” Heather says. “It was the worst possible place for someone like me with spinal issues. So I gave it up. I took up an anti-inflam-matory, plant-based diet, started doing yoga and focused on healing from within.” And she did. Slowly but surely, Heather got stronger and proved her doctors wrong. While she still lives with chronic pain and some mobility restrictions, she is not confined to a wheelchair. Last year, Heather received an email advertising the Charity Challenge trek to Machu Picchu. With the support of her husband and a friend, Heather began fundraising through the program, which lets travellers choose between “self-funding” their trip and raising a smaller amount for charity, or “flexi-funding” which requires more of a fundraising contribution. It wasn’t always easy for Heather. She experienced some flare-ups while preparing for her trip and at times shewas fearful of travelling to such a far-off destination. The trek to Machu Picchu takes a physical toll on even the most seasoned traveller or hiker. “Little did I know, there was nothing to worry about,” she says. The nine days with her group was one of the most spiritually fulfilling experiences of her life. It was more than just the physical challenge, more even than seeing the stunning ruins of Machu Picchu with her own eyes. It was travelling with people with whom she shared a common cause, and that she knew they were all making a difference for people like her who are living with this debilitating disease. Currently The Arthritis Society is polling its supporters to select the next destination for the group to travel. Possibilities include the Great Wall of China, the Sahara Desert, the summit of Kilimanjaro and more. Participants can also choose their own trek and dedicate the funds raised to The Arthritis Society. Cherie-Lynne Whiteman is the Senior Manager of Fundraising and Stewardship for The Arthritis Society.